France rejected Iran's request for more talks on the Islamic republic's nuclear program, saying Wednesday that Tehran first must suspend its atomic activities. The foreign ministry says Tehran's decision to resume some of its activities means it would be impossible to meet under "satisfactory conditions," reports CBS News correspondent Elaine Cobbe. Iran had asked for a ministerial-level meeting with France, Germany, Britain and the European Union. "Iran must return to a complete suspension of these activities," French Foreign Ministry spokesman Denis Simonneau said. French insistence that Iran suspend its program before negotiations can resume is part of a wider effort to pressure Iran to halt nuclear research that the West fears could lead to nuclear weapons. Iran insists its program is for civilian use. Iran broke a moratorium this month on Iranian enrichment — a path to nuclear arms. U.S. Undersecretary of State Nicholas Burns supported the idea that Iran should suspend its program and return to talks. "There is a consensus that Iran should turn back, return to negotiations and suspend its nuclear program," Burns told reporters in Bombay, India, during a South Asia tour. "But that's not the path Iran is on now." The Bush administration sent Burns to London to coordinate a strategy with Britain, China, France, Germany and Russia on dealing with Iran. Burns conceded differences remained after Tuesday's meeting. "We reached a consensus on some points ... others need to be worked on," he said. Burns repeated U.S. demands that the U.N. nuclear watchdog agency refer Iran to the Security Council — where it could face sanctions — for resuming research on centrifuges used in uranium enrichment. 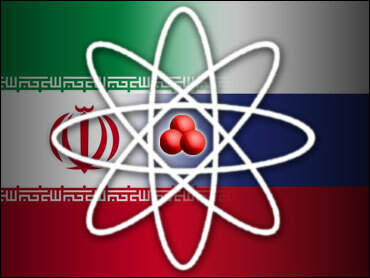 Russia and China oppose sending Iran to the Security Council. Earlier Wednesday, Iran's foreign minister told state radio the nation's chances of being referred to the Security Council were slim. Manouchehr Mottaki did not give a reason for his view, but emphasized that Iran wanted to restart negotiations with Britain, France and Germany. The European states, with U.S. backing, were calling for a Feb. 2 meeting of the International Atomic Energy Agency to discuss taking action against Iran following Tehran's decision earlier this month to resume small-scale enrichment of uranium — a process that can produce material for atomic reactors or bombs. A draft resolution for the meeting, read in part to The Associated Press in Vienna, says Britain is proposing that the 35-nation IAEA refer Iran to the Security Council, but it stops short of calling for punitive measures. Instead, the draft urges the 15-nation council to press Tehran "to extend full and prompt cooperation to the agency" in its investigation of suspect nuclear activities. Other members of the IAEA board, including Egypt, also are cautious about Security Council involvement. "In view of the overall situation, we regard the possibility of the hauling of Iran's nuclear case to the Security Council to be weak," Mottaki told Iranian radio. "During the past 10 days we have tried to relay our message to all relevant parties, including the Europeans, about readiness of Iran to negotiate on the production of nuclear fuel." Mottaki said he hoped European countries would avoid taking steps that could only worsen the current situation — an apparent reference to U.S. and European talk of sanctions. The United States accuses Iran of trying to secretly build nuclear weapons — a charge Iran denies. Britain, France and Germany have been trying to persuade Iran to import nuclear fuel, but Iran has rejected this. Meanwhile, a delegation of Israeli security experts was in Moscow on Wednesday to meet with Russia's Security Council and Foreign Ministry in hopes of winning Russian backing for Security Council referral. Russia's Interfax news agency said the head of country's nuclear energy agency, Sergei Kiriyenko, met with the delegation led by Israeli National Security Chief Giora Eiland. The delegation hopes to win Russian backing for referring the Iranian nuclear issue to the U.N. Security Council, the Web site of the Israeli newspaper Haaretz reported. A referral to the council, where Russia is a permanent veto-wielding member, could result in sanctions against Iran. Israeli Army Chief of Staff Dan Halutz, while calling Iran the only remaining threat to Israel's existence, said Israel would not launch a pre-emptive strike against Iran's nuclear facilities, reports CBS News correspondent Robert Berger. He said other nations should do it instead. The big question is what if the U.S., Europe and the U.N. do nothing. Acting Prime Minister Ehud Olmert has said Israel cannot allow Iran to get the atom bomb. French Foreign Minister Philippe Douste-Blazy was scheduled to meet with Russian officials on Thursday.